As in all Mission centers, the primary goal of Chinmaya Mission St. Augustine, Chinmaya Govardhan, is to honor and serve Pujya Gurudev’s vision by sharing the Vedantic knowledge He gave us. The name Govardhan itself expresses beautifully what we hope to achieve here, since “vardhana” means that which uplifts, nourishes, or gladdens, and “go” refers to the Vedas, mind, senses, earth, and cows. As the Lord showed in His Govardhan-lila that He is the ultimate refuge of all beings, so too, we envision Chinmaya Govardhan as a place where people of all backgrounds can seek and live the Truth through Vedantic scriptural study and Self-inquiry, where body and mind can be uplifted through healing awareness and devotion to God, where we can practice living in harmony with the environment. The center is located one hour from Jacksonville International Airport and is 20 minutes away from St. Augustine’s beaches, Nature preserves, and other tourist attractions. We had our first retreat on the auspicious weekend of Radhashtami. 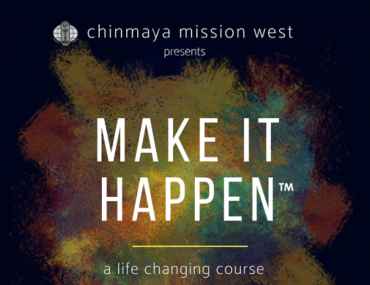 Since then, we have held more retreats and workshops, where CM center’s devotees, collectively and individually, have visited, served, and spiritually unfolded. Swamini Radhikananda, formerly Brahmacharini Arpita, received sannyasa initiation from Pujya Guruji Swami Tejomayananda on Mahashivaratri day, February 17th, in 2015. Her spiritual search early in life culminated in meeting Pujya Gurudev Swami Chinmayananda in 1978 when he was conducting a Gita Gnana Yagna in Washington, DC. After attending weekly Vedanta study-groups for several years while completing college, a master’s degree and work in special education, she joined the two-year Vedanta course at ‘Sandeepany Sadhananalaya,’ Mumbai, from 1987-88 under the blessed guidance of Pujya Guruji Swami Tejomayananda. 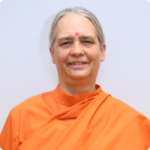 Since returning to the States in 1989 she has served at several CM centers, including Washington DC, Krishnalaya and Los Angeles teaching Vedanta, Shrimad Bhagavatam, and Bhagavad Gita for adults, and conducting Bala Vihar classes for children. Sw. Radhikananda has also recorded several CD’s of devotional songs for children in English, including ‘Come to Me, My Krishna,” “His Eternal Smile,” and “Songs for the Light”, a CD of chants rendered in east-west kirtan style. 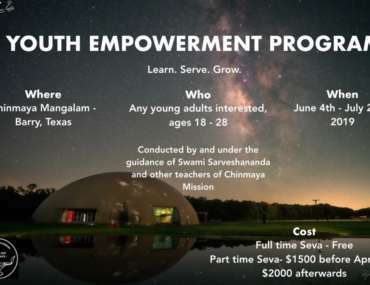 Swamini Radhikananda presently resides and teaches at the Chinmaya Mission St. Augustine center, “Chinmaya Govardhan,” a serene and beautiful 18 acre ashram on the outskirts of historical St. Augustine, Florida. Classes are also conducted in the local area for western audiences and students of yoga. 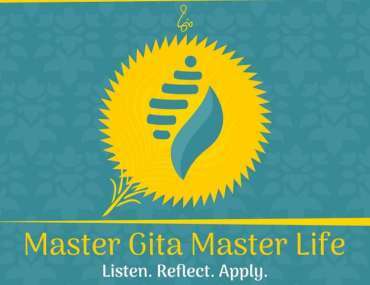 Swamini considers it her greatest privilege and joy to share the universal, transformative teachings of Vedanta and Bhagavad Gita with other seekers, from any background.